The unique 3-piece design makes Vena Mirage easy to install and remove. Just slide off the bottom piece to connect your Apple iPhone 7 to charging or multimedia dock while leaving the top piece intact. 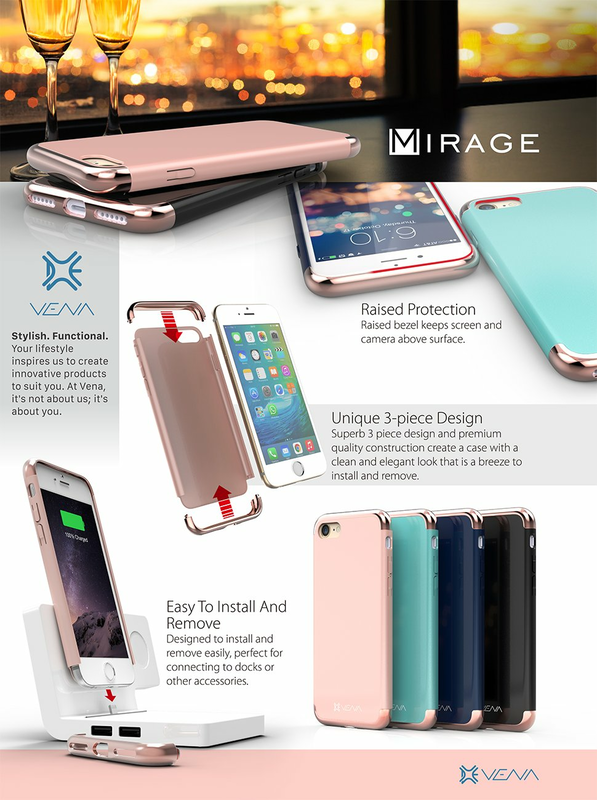 Vena Mirage is made out of polycarbonate (PC) with soft and smooth rubber coated exterior to provide exceptional grip to your Apple iPhone 7 while protecting it from dust, dings, and dents from everyday use. The slim and stylish profile protects your phone with minimal bulk and complements the essential look of your Apple iPhone 7. 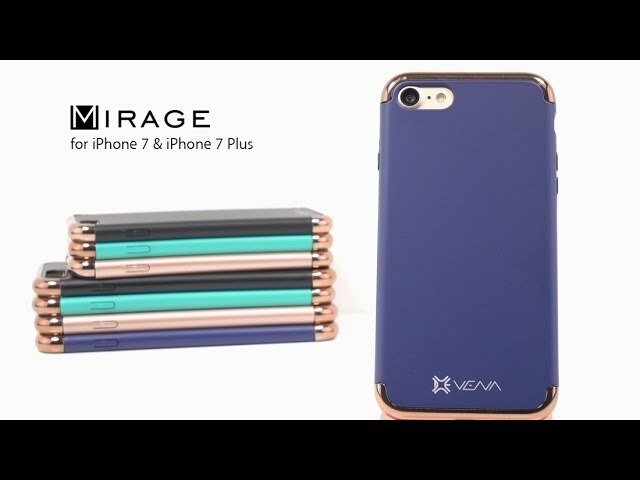 Vena Mirage is designed with precision cut-outs to suit the Apple iPhone 7 and provides effortless access to all ports, buttons, and features. The beveled power and volume buttons are crafted to maintain the same great tactile feedback from your phone's buttons. 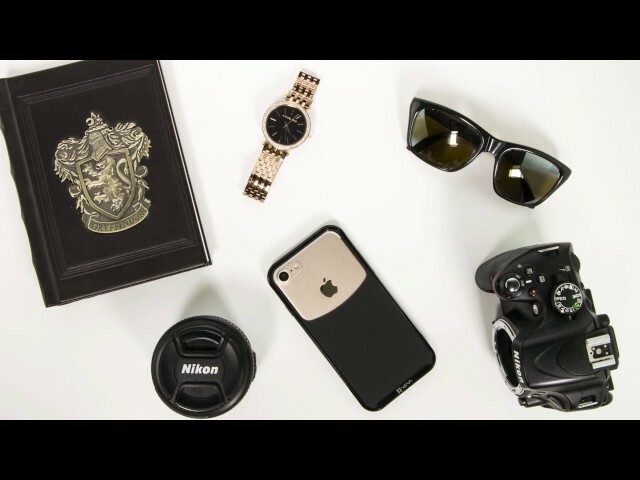 I loved the case. Until not even two days later, it broke. I'm incredibly disappointed because the bottom part that slides on broke and now slides right off. I love the case, it's holding up nicely, it's been over a month since I started using it and I could not be more happy with it. Also I have gotten many comments from other people that they love the case and the way it looks! The biggest downfall is that the gold pieces at the top and bottom come off too easily and your fingerprints show on the blue part. I wouldn't trust this case to keep my phone protected in the long run but it will do for now. This case scratched easy and one of the clips broke within a couple of months of use. It was a pretty case. It is sleek, nice color, and easy button use on sides of phone. Color was a little more saturated that this picture, but still pretty. A good value for the money. Love this case! Not too bulky, but definitely productive! Great color and great fit. I was very happy with this case initially but the ends never slid on properly so there was a thin gap that eventually got loose and caused me to drop my phone. It looks really nice and the buttons on the side fit perfectly I just think I received a defective one. Poorly made but for the price I guess I wasn't surprised. Broke after 2 days, I had to send it back. Great case bout it for wife she loved it. Not as great as in the picture, but the top and bottom are clamps. I really didn't like that they were clamps and also they chipped very easily. Really a cheap case to me. This case looks great, but the metal edges offer no protection. There is no rubber between the metal and the phone. My phone dropped to the floor from less than Two feet and the screen cracked right where the metal corner meets the phone. Would not recommend to anyone.